Again yesterday, we heard the promise of 4%-plus U.S. GDP growth in the coming years. Monday, I believe it was President-Elect Donald Trump’s new Treasury Secretary appointee Steven Mnuchin I saw across the gym on MSNBC making the promise. A few weeks ago we heard him promise 3 to 4 percent. Of course, a goal like this by necessity includes plans to ignore the need to reduce greenhouse gases, and I think it also requires leaving caution to the wind in every aspect of environmental protection and stewardship. It would appear that is in our future here in the U.S. But such a goal also requires the cooperation of nature, and this is where I have my biggest doubts. I think we’ve exceeded the limits to growth, and finally the Earth is pushing back. I suspect 3% annual GDP growth for the U.S. is history, though I expect we’ll waste much time, energy and resources trying to gin it up. 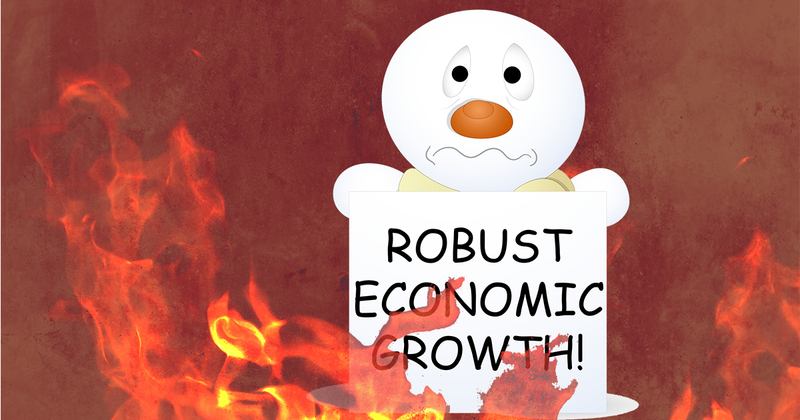 There’s Not a Snowball’s Chance in Hell of 4% Growth! “We don’t need more supply, except in a few little places here and there – like nurses! The system we’ve created may “need more demand,” but our planet does not. Being in the finance industry, Dent doesn’t appear to understand the physical limits to growth, or the great damage economic growth on a full planet does to our life-supporting ecosystems. So he writes as though 4% growth would be nice, but just isn’t possible in today’s circumstances. He considers 3%+ growth “a great boom,” instead of the destructive binge it actually would be. “The U.S. population grew at 1.1% between World War II and now. Even by rosy government estimates, population growth will be 0.6% into 2060. My estimates, adjusted for the reality of falling birth rates since 2007 and immigration in this slow and much slower ahead economy into 2023 or so, is 0.27%. Bravo to Dent for explaining that the days of 3% GDP growth are behind us. Now, if he would just get on board the sustainability train and explain how no growth would be a good thing for our life-supporting ecosystems! On the chance Mr. Dent should read this critique, I’ll recommend some of the reading at More About Limits to Growth.